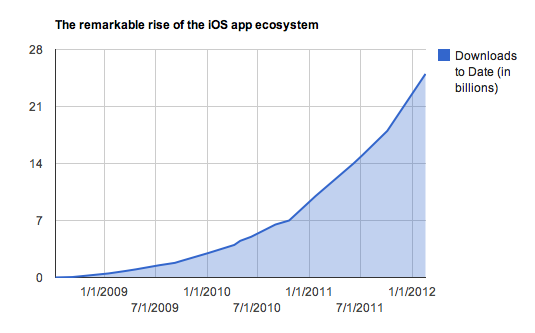 Apple’s iOS ecosystem keeps on rolling. The company said it has more than 600,000 apps in the store, up from the 550,000 number they confirmed a month ago. I regularly talk to top-grossing developers too, so I have an anecdotal barometer of revenues per day. Last summer and fall, revenue for a top-grossing app hovered at around $3 million per month. Then Epic’s Infinity Blade II proved that a single iOS app could do $5 million in a month in December, the very lucrative holiday month. After surveying developers who have held the top grossing iPhone rank, I’m hearing that the slot is doing about $250,000 to $300,000 in revenue per day now, including both in-app purchase and advertising revenue.